States in the Liptako-Gourma region - including Burkina Faso, Mali and Niger - are imposing restrictive measures to try to quell the growing threat of terrorism. These include limiting the freedom of movement in several parts of their territories. Burkina Faso's government declared a state of emergency in seven of its 13 regions on 31 December 2018 due to increased attacks by violent extremists. In all Liptako-Gourma countries, emergency measures have included banning motorbikes and pick-up trucks, restricting people's movement and closing markets and weekly bazaars in affected areas. The authorities argue that motorcycles are used by violent extremists to carry out attacks, and that these groups also use markets, especially weekly ones, to buy food supplies. They also suspect that the groups benefit from illicit trafficking such as cross-border fuel smuggling, to finance their activities. In Central Mali, the decision of the army chief-of-staff on 1 February 2018 to prohibit the use of motorcycles and pick-ups in many areas generated mixed reactions. While the authorities believe this decision has significantly reduced the number of attacks - mainly those carried out by armed individuals on motorcycles - people complain about the constraints caused by the prohibition. The measures are meant to stop terror attacks, but they are depriving communities of a big part of their livelihoods, and are further increasing their vulnerability. 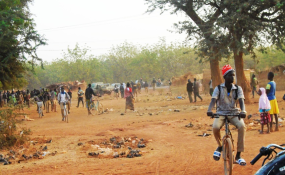 Between June and September 2018, the Institute for Security Studies (ISS) interviewed community members in Liptako-Gourma to understand the implications of counter-terrorism measures. Results show that the prohibition has negatively affected the movement of people and goods in peripheral areas that rely on pick-ups and motorcycles for transport. In some places, restrictions on the use of these vehicles has led to a rise in the cost of transport and the price of goods. In the Ténenkou Cercle in Mali's Mopti region, the price of 1 kg of catfish has increased from 1 250 CFA francs (US$2.15) to 2 250 CFA francs (US$3.87). The supply of goods to markets has been negatively affected as producers from neighbouring villages such as Nouh Bozo and Sènè Bambara are finding it hard to transport their produce. This has increased the risk of food insecurity in the area. Disruption of supply chains has also worsened the livelihoods of farmers who are unable to move their goods to urban markets. In the south-eastern Diffa region of Niger, where Boko Haram has been active, traffic bans or market closures have been in place since 2015. These measures have since been extended to the Tillabéri area after numerous terror attacks were attributed to armed people who often travel on motorcycles. In Tillabéri, motorcycles are used for medical evacuations and to supply medicines. The restrictive security measures have made some health workers unwilling to visit areas under the state of emergency. The situation has undermined the operations of integrated health centres or health huts, affecting delivery of, and access to, basic social services. For most interviewees, the measures haven't stopped terror attacks, and have negatively affected their socio-economic wellbeing. The actions were also taken without consulting local populations to ensure their effectiveness and applicability to specific contexts. The trend in terror attacks in several parts of Soum province (Burkina Faso) which borders the region of Mopti (Mali) where traffic bans have been in place since March 2017, shows no clear sign that the measures have been effective. Straight after the restrictions were imposed, the number of attacks dropped, but then rose again, as violent extremist groups adapted. So, despite the restraints and traffic bans, insecurity linked to the terrorist threat persists, and has even spread to other parts of the Liptako-Gourma region. The figure below illustrates the trends in attacks before and after the imposition of restrictive measures. The economic impact of the closure of weekly markets has also been significant. Besides the loss in income for traders, markets occupy a central place in people's lives and represent important spaces for social, political and cultural exchanges. They contribute to strengthening social cohesion in areas shaken by inter-community tensions. The restrictions have not only deprived people of their livelihoods and access to services though - they've increased their vulnerability to violent extremism, as these groups exploit the situation to lure youth into their fold. Although state agencies see restrictive measures as effective and instrumental in the fight against violent extremism in Liptako-Gourma, on the ground there is frustration and disapproval from local populations. People see themselves as double victims caught between violent extremist groups and government responses. States in the region need to address the shortcomings associated with these counter-terrorism actions, and improve communication with local communities when they are implemented. The restrictions should be gradually eased when the security situation allows. This could be accompanied by other efforts such as providing basic social services, including food and healthcare. In offering these services, security and defence forces could provide a social role and compensate for the shortage of state personnel and humanitarian organisations in these areas. Restrictive counter-terrorism actions can be counterproductive if they make it difficult to build trust between government and citizens. To prevent and counter violent extremism, Liptako-Gourma states need to develop strategies based on communication and consultation with communities. This will strengthen relations between the state and civilians, and increase community resilience to violent extremism.